Input text: 1st 2.6 feet tall and 5 feet long flat clear blue tree is 8 feet above the ground. it leans 80 degrees to the front. 2nd 2.4 feet tall silver flat tree is .5 feet behind and -2.2 feet above the 1st tree. it leans 90 degrees to the front. the ground is black. 9 salmon lights are -1.3 feet behind and -.2 feet above the 1st tree. the camera light is black. 7 coral lights are -1.3 feet behind and -.2 feet above the 2nd tree. the sun's altitude is 12 degrees. the sun is rust. 3rd 6.5 feet tall and 11 feet long flat clear pink tree is 1 feet behind and 1.4 feet above and -7 feet left of the 2nd tree. it leans 78 degrees to the front. 4th 5.9 feet tall and 9.9 feet long flat silver tree is .5 feet in front of the 3rd tree. it leans 78 degrees to the front. the sun's azimuth is 220 degrees. a very tiny camel is on the ground. it is 3 feet in front of the 1st tree. the ground is 70 feet tall. 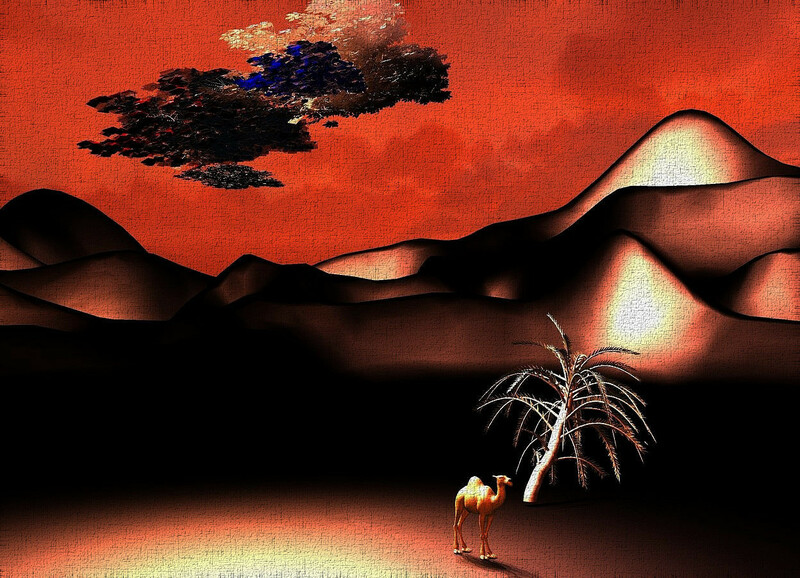 a very tiny palm tree is 1 feet behind and 3.5 feet right of the camel.